I don’t know about you, but downing at least 64 ounces of water per day is tough. Companies have come up with low or no calorie drops that you can add to your water to give it a more flavor,and more chemicals and artificial ingredients to boot. Vitamin Water lists 20 ingredients, mostly unpronounceable, on the label of their water enhancers and popular brand Mio is right behind them. Don’t get drawn in by the occasional vitamin listed on the label. The artificial sweeteners, and other additives far outweigh the benefits of a little bit of vitamin B. While enhancing the taste of your water might help you drink more, doing so naturally is the best bet. You can make your own naturally flavored water by adding fresh fruit and herbs to a pitcher of water and letting it steep in the refrigerator overnight. You can also freeze pieces of fruit and water in ice cube trays to provide a flavor boost while keeping your water chilled. Be sure to carefully scrub all of the fruit before using to avoid adding any impurities to the water. Citrus fruits, such as lemon, lime, grapefruit or orange add vitamin C and a lot of taste to your drink. Try adding less obvious choices, such as cucumber, strawberries, mint leaves or grated ginger. Many of these are known to reduce bloating and help digestion. Create your own combinations to suit your palate. 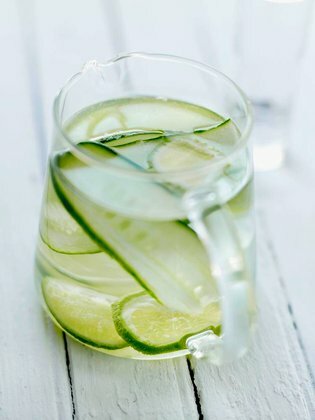 How about cucumber, mint and lemon or lime? Orange and ginger? Grapefruit and basil? Give it a try and share your favorites in the comments below. This entry was posted on September 9, 2014 at 7:00 am and is filed under Food. You can follow any responses to this entry through the RSS 2.0 feed. You can leave a response, or trackback from your own site.